I’m talking about the two days that we are going through here in the United States. Thanksgiving is Thursday, the fourth Thursday of the month of November every year. When the Pilgrims started the tradition almost four centuries ago, they lived very simple and frugal lives. Their purpose was to thank God for His bountiful blessings. Life was hard – many had lost relatives crossing the Atlantic. Their new home was hostile and they had to start farming from scratch. They were very appreciative of all they had. They could never have imagined that a future generation would follow Thanksgiving with Black Friday, surely the most shameful day in the American calendar. If not shameful, it’s certainly the most embarrassing day of the year. When I see a report on the evening news showing crowds pushing and shoving, yelling and screaming, to buy more and more things that they really don’t need, all I can think about is how people around the world must see us. When we do go broke, I can’t imagine any other nation will be willing to bail us out! Why do we have to have everything? The latest electronic gadget – people have to have it now; and if they can get it 50% off at 4am on Friday, they will be there, ready to push everybody else out of the way. It’s not just Black Friday that’s the problem. On Sunday we were visiting our eldest daughter, Alix, and her family in Indianapolis. We met up at Costco. We don’t have a Costco in the Lansing area, so when we visit Alix and Mike we like to go there. Previous generations would not shop on what they considered “the Sabbath”, a biblically commanded day of rest. It was a time devoted to worshipping God, fellowship with other believers and family. Today, there seems to be no concept of devoting time to God. Perhaps that explains why there is so much wrong in our society. Many, perhaps most, Sunday churchgoers, head straight for restaurants after church and then go shopping. Later, they may watch a game of football and by evening are watching the worldly, trashy programs everybody else watches. They may hear about the Ten Commandments in the morning but by evening they are avidly watching people break them on their favorite TV shows! Our national religion is materialism, the accumulation of more and more things. There’s been a boom in “storage” facilities the last twenty years. Why do people need them? They need to rent space to store the things they can’t fit into their homes, which are twice the size of their parents homes, even though they only have half the number of children. Although we are less than 4% of the world’s population, we buy 40% of the world’s toys. The new pope is vigorous in attacking the materialism of this age. Although Pope John Paul II did the same, he was noted more for being anti-communist and helped bring down communism. This pope is decidedly anti-capitalist. I’m finishing this post Thanksgiving Day morning. The newspaper today brought the biggest stack of ad inserts I’ve ever seen, all promoting their special “door busters” for tomorrow morning. Some stores are starting tonight. 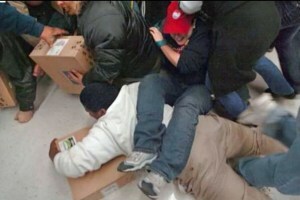 They can’t even let people alone one day to give thanks – they want them in the store tonight to maximize profits. Given time, Black Friday and Thanksgiving may be one and the same day, if stores continue the trend of starting their sales earlier and earlier. Millions of people (33 million according to the news this morning) will be out shopping for more things instead of giving thanks for what they already have. Greed is bringing us down. On these two days, people should examine themselves by asking one question: do I spend more time giving thanks or more time accumulating things? You may find you’re part of the problem! Jesus Christ gave us a warning when it comes to our priorities. “For what shall it profit a man, if he shall gain the whole world, and lose his own soul?” (Mark 8:36). If you are thinking of going out early tomorrow to fight, kick, yell and scream for the latest bargain, you might want to ponder on this first!